All my scripts were written in email and sent to myself because I’d originally been working on these during downtime at the old dayjob and so I needed to see the scripts there. Due to this I can’t actually edit the scripts, so when I realized I forgot to type down that I caught a Sandygast I just had to remember about it. Granted at this point I could put it all in a notepad since I’m doing these at home but uh. At this point the only time you’re gonna see my eyes is when I’m wearing this ridiculous outfit. As hinted at last time, Mimikyu has been added to the party, slick, along with Mareanie. This is a bittersweet point–Sludgy-Mouth is gone, who ended up being ridiculously fun to draw in the comic, but she is gone now. On the other hand, now we have Slick. MIMIKYU JOKES FOREVER. And yes this is an Inkling from Splatoon with a Mareanie hairstyle. 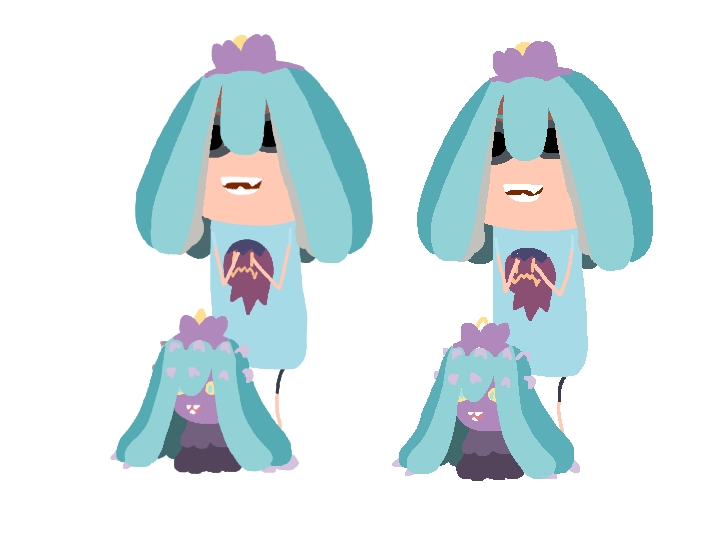 You can change your hairstyle in Spla2n and I really want a Mareanie hairstyle available. 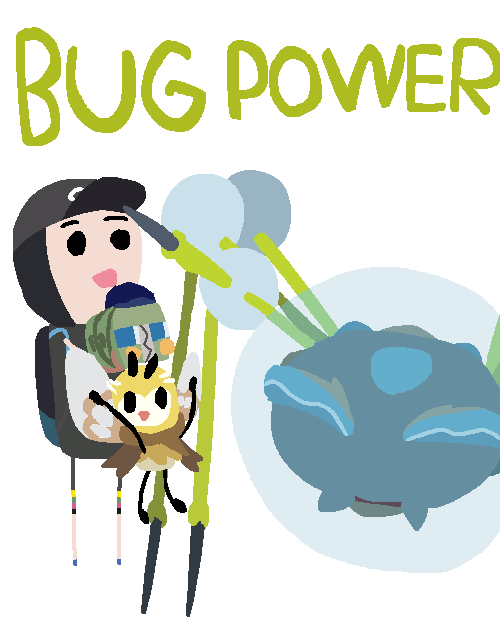 Gen 7 was very good for Bug-types, which is good considering the terrible showing it had in gen 6. And Araquanid is kind of ridiculous for a Pokemon that evolves on level 22. Also, happy I get to draw Ribombee now. Like Cutiefly, its appendages are very fluid and wobbly. I really like how this one came out. 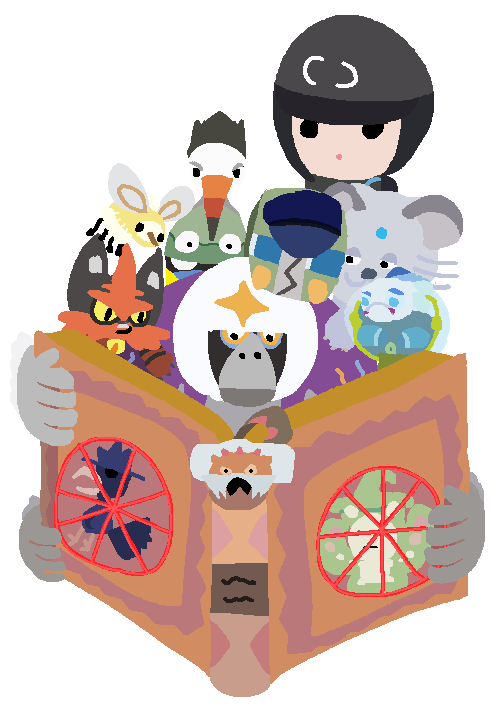 The book, Oranguru considering it was my first time drawing it. 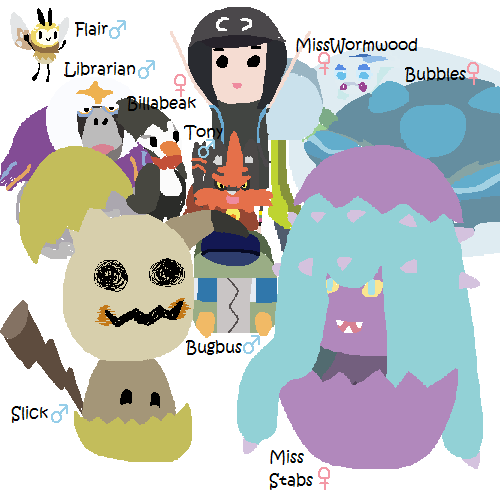 Some of the Pokemon were cramped, especially around Dewpider and Wishiwashi, but it worked out well. I also realized the circles on the book should’ve been angled a bit but oh well. I liked it enough to make a version without names. I finished comic 60 a while ago but totally forgot to put these up here! I should look into having a separate page for these I can just update with new comics but oh well. In this comic, stuff happens. Then the last comic was ridiculous to make. Longest one so far.